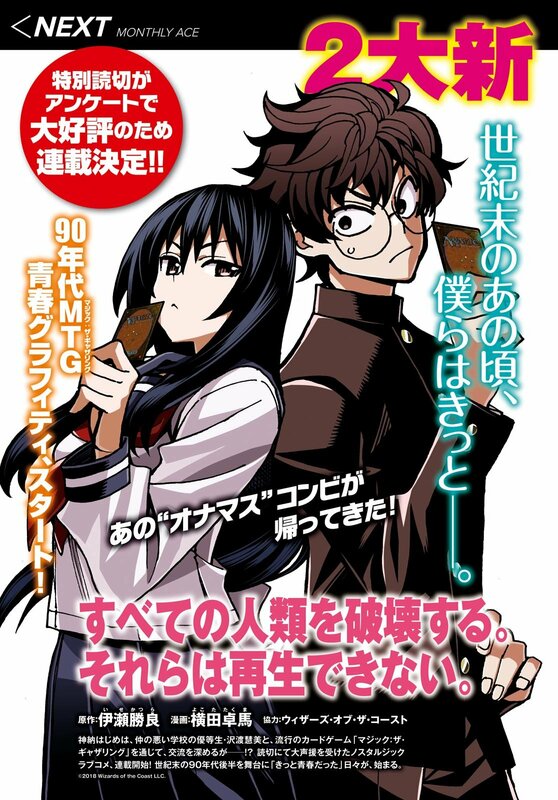 Manga creators Takuma Yokota and Katsura Ise published a one-shot version of the manga in Monthly Shōnen Ace in its October issue on August 25, and now, some scans have made its way online so if you love old school Magic and anime/manga, you can check it out at Fallen Angels. The "youth graffiti" manga centers on two people in the 1990s who play Magic: the Gathering. The manga is actually a good read. Of course, it's easy to compare this to Kazuki Takahashi's popular Yu-Gi-Oh! manga which also features a trading card game. Old school Magic players would recognize the iconic artworks of cards from Magic's early days. Its title is even a reference to the card Wrath of God. Yokota announced on Twitter that he is turning the one-shot manga into a serialization, and will launch the manga in the January issue of Kadokawa 's Monthly Shōnen Ace magazine on November 26. Ise is credited with the original work, and Wizards of the Coast, the publisher of Magic, is credited with cooperation. Would you like to see more Japanese manga about Magic: The Gathering?